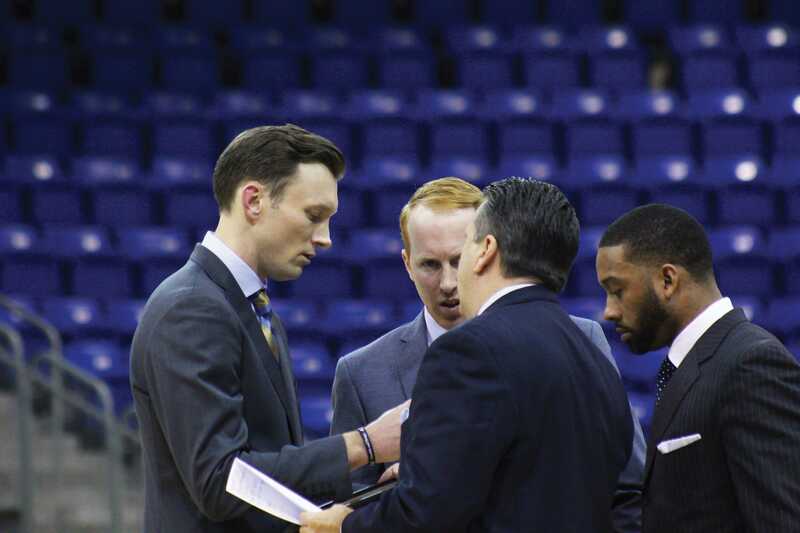 As the Quinnipiac men’s basketball season begins, new head coach Baker Dunleavy will lead his team into a new era. He’s not alone, though, as his new assistant coaches and players will be starting the journey together. 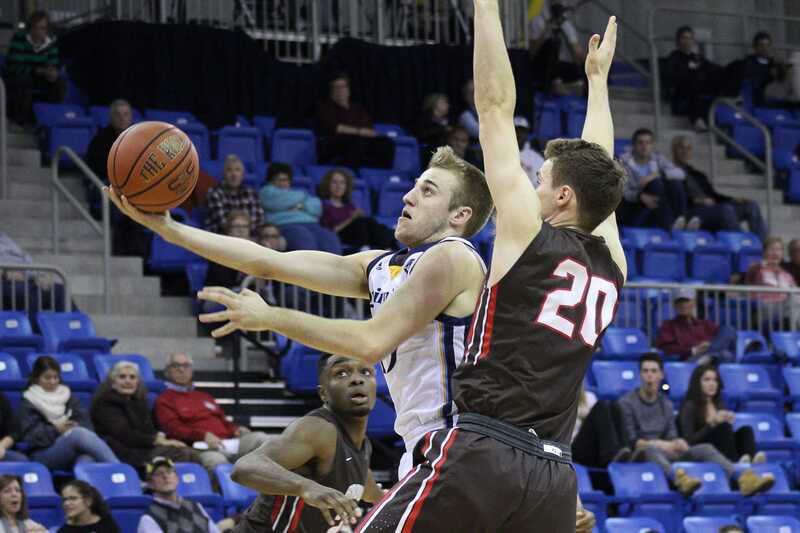 There’s one thing Baker Dunleavy wants his team to have by the end of the year. The highly coveted acquisition isn’t physical. It’s not something you can acquire after one practice, after running a few plays smoothly; it takes time. They call it a moving target. That moving target is what Dunleavy calls a cohesive culture. “It’s a day-to-day process of building trust. You can’t say, we’re there, we’ve built trust. It’s more of, we had a good day today,” Dunleavy remarked. As Quinnipiac fired former head coach Tom Moore, Dunleavy was in Villanova, Pennsylvania, preparing for the Big East tournament. The Wildcats were on the heels of their fourth consecutive Big East title. In Hamden, it wasn’t just a team in flux; it was an entire program hanging in the balance. Quinnipiac athletic director Greg Amodio had to nail the hire. He had to bring hope to a program that had failed to deliver. Enter, Baker Dunleavy. When the job opened up, Dunleavy didn’t think much of it. As he put it: the more time went on, the more perfect of a fit it became. Getting here was the first step. The moving target was in its infancy. “You just try and listen to people who have done this before, just try and take from people’s experiences and learn and read as much as you can,” Dunleavy thought at the start of the year. Keeping in line with using the guidance from those before him, he looked to fill his first assistant coaching spot. Enter, Tom Pecora. The first coach added to the staff, Pecora had been out of coaching for two years before getting the call from Dunleavy. Coming from Hofstra and Fordham, Pecora brought a sense of wisdom to the team that Dunleavy strove for. “Tom is a veteran, he’s been around. He’s got some age on the other guys, but wisdom and experience, too. He’s been in the seat that I sit in, so that’s been immensely helpful,” Dunleavy said with confidence. Those other guys, they were the last piece of the coaching puzzle. There were three things Dunleavy looked for in his last two vacant spots; level, region, and culture. Enter, Shaun Morris and Anthony Goins. Morris, a former assistant at Boston University, brings a young, youthful feel, as Dunleavy describes. Goins, who comes to Hamden from nearby Yale, brings a winning pedigree and recruiting prowess. The one thing that Goins, Morris, and Pecora all have is something that Dunleavy welcomes: diversity. He didn’t want to hire the same person for each spot; he wanted a synergy. After assembling his staff, it was time for the next step. Enter, players. The whirlwind of a process led Dunleavy and his staff to first take a look at the mid-Atlantic and New England region. This was an area his assistants had power in recruiting in the past. This led the staff, like many others in the country, to look at who was available via transfer. Enter, Kevin Marfo and Travis Atson. These were the two that stood out in Dunleavy’s mind due to scouting them before when they were at George Washington and Tulsa, respectively. “You feel like, alright, even those guys are American League players, A10 players, with the way we do things here (Quinnipiac), we feel like we might have been able to get them,” Dunleavy said when he thought back on the initial process. After the explosive duo of Peter Kiss and Mikey Dixon left the program following Moore’s firing, the point guard position suddenly became a gaping hole on the roster. Enter, Rich Kelly. The playmaking, space-creating guard from Cheshire was an immediate target for the staff. There’s one player, though, who isn’t new to the college game. That’s fifth-year player Alain Chigha, or as the team calls him, Al. For Dunleavy, he’s been an extension of the coaching staff. It’s something the team not only loves to see but something they need. As Baker put it, everyone is new, whether or not they’re playing for him for the first time. He also believes that the group hasn’t earned the right to be picked anything other than towards the bottom of the league. They have to prove their worth. “I don’t want this year to be about one thing. I think any time you’re in a team sport, even the last few years at Villanova, not once did we ever say, ‘Hey, here’s the goal, win the Big East Championship,’” Dunleavy said about setting goals. Practices, the late nights watching film, it’s all led up to this: basketball. It’s going to have its ups, but there will certainly be downs. One step forward and two step backward; it’s a trend that even Dunleavy admitted might become a reality. The search, though, to finally catch that moving target, might never end.